75,000 Bonus points after you use your new Card to make $3,000 in purchases within the first 3 months. 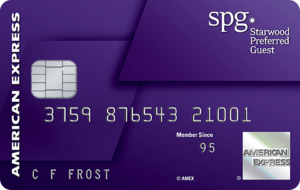 Now earn 6 points for each dollar of eligible purchases at over 6,500 participating SPG® and Marriott Rewards®hotels. Earn 4 points for each dollar of eligible purchases at select business and travel categories. 2 points for each dollar of all other eligible purchases on your Card. Welcome offer not available to applicants who have or have had this Card. We may also consider the number of American Express®Cards you have opened and closed as well as other factors in making a decision on your welcome offer eligibility. Effective 8/26, welcome offer not available to applicants who (i) have or have had the Marriott Rewards® Premier Business Credit Card from Chase or Marriott Rewards Business Credit Card from Chase in the last 30 days, (ii) have acquired The Marriott Rewards® Premier Plus Credit Card from Chase or The Marriott Rewards® Premier Credit Card from Chase in the last 90 days, or (iii) received a welcome offer in the last 24 months on The Marriott Rewards® Premier Plus Credit Card from Chase or The Marriott Rewards® Premier Credit Card from Chase.